“Elvis: The Searcher” packs in quite a bit of visual and audio content as it follows Elvis’s musical career from his youth in Tupelo and Memphis through the Graceland Jungle Room recording sessions in 1976. Most veteran Presley followers will find little they didn’t already know in the film’s recounting of Elvis’s long and eventful career. The documentary’s achievement, rather, is in how it tells that story, which it does in a most unique and creative way. Instead of just following along the chronological procession of “Elvis: The Searcher,” let’s take a look at some of the film’s elements that make it so interesting to watch. • What was Elvis “searching” for? One subtle way the “searcher” theme is emphasized in the film is in the recurring aerial image of a solitary bicycle rider peddling down a woodland dirt road. 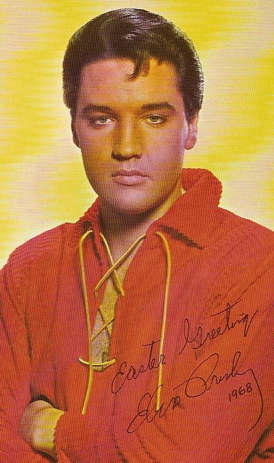 The rider appears at times when the film touches on critical creative moments in Elvis’s life, such as his return to civilian life after his army service. 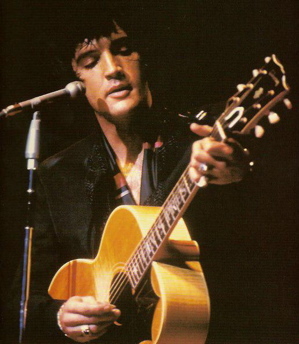 Another “searcher” connection comes at the end of Part 1, when Elvis’s recording of “Lonely Man,” containing the lyric line, “Searching, always searching, for something he can’t find,” plays over a visual montage. 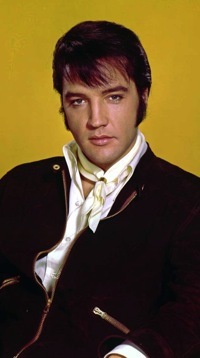 The “searcher” theme surfaces again each time Elvis needs to refocus and recharge his career, as in 1968 with his “Comeback Special.” The film also cleverly uses that event as a recall element to prevent monotony in its chronological flow. “It was either the beginning or the end of his career,” Priscilla says of the ’68 special. Since it was actually both, a reminder of where he had been and a promise of where he was going, the mid-career NBC show was a perfect fit for the film to momentarily jump off the story line here and there. The opening of “Elvis: The Searcher” jumps forward in time to Elvis singing “Trouble” in the ’68 special, and at the film’s end, it jumps backward to Elvis singing “If I Can Dream” from the same show. Breaking from the usual documentary formula, “Elvis: The Searcher” has no single narrator. Instead, more than two-dozen “experts,” we’ll call them, trade off providing commentary on Elvis’s career and the cultural backdrop in which it was played out. Priscilla is included, of course, along with musicians, historians, writers, recording producers, and record label executives. 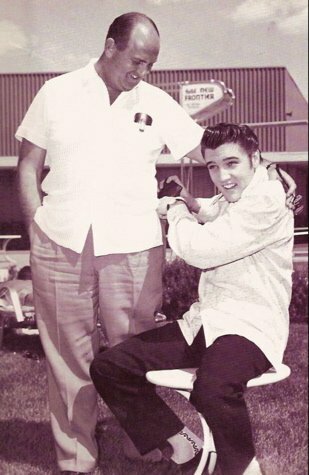 Jerry Schilling and Red West represent Elvis’s “friends and associates.” Elvis’s voice is also heard in exerts from past interviews, as is Colonel Parker’s. Despite the lengthy and diverse cast of “experts,” one can’t help but wonder why some others were not included. Elvis’s daughter is one of them. Although she was only eight years old when her father died, Lisa Marie certainly could have added to the discussion. Also, Peter Guralnick, the author of Elvis’s definitive biography, is not heard. As noted earlier, though, decisions had to be made. “God bless him. He was the light for all of us. We all owe him for going first into battle. He had no road map and he forged a path of what to do and what not to do. We shouldn’t make the mistake of writing off a great artist by all the clatter that came later. We should dwell in what he did that was so beautiful and everlasting, which was that great, great music. 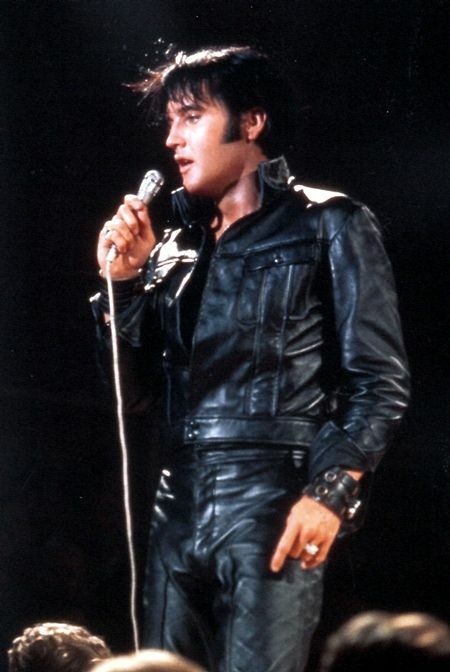 The body of the documentary opens with a lengthy examination of the influences, both cultural and musical, that would later coalesce in Elvis’s music. The historians are useful here in describing the social landscape in the South during Elvis’s youth. 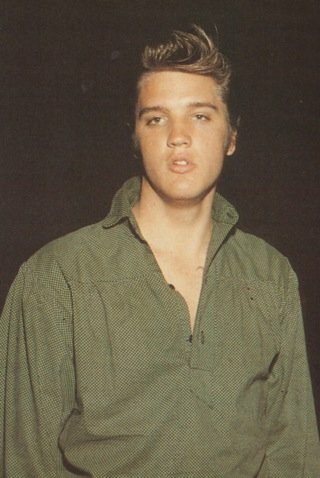 Poverty’s impact during his early years in Tupelo is stressed. Priscilla says, “Elvis never forgot the experience of living in poverty, ever. It stuck with him his whole life.” It’s a theme she comes back to later in the film. According to Priscilla, the purchase of Graceland in 1957 represented the rise out of poverty that Elvis had longed wanted for his family. “Elvis never wanted to go back to the days when they struggled, the days of poverty,” Priscilla reaffirms. Early on, then, the viewer begins to realize how Elvis’s deep dread of poverty muddied the water of his creative instincts over the years and how Colonel Parker’s moneymaking talents appealed to Elvis’s deepest fears. On the other hand, Parker is criticized for limiting Elvis’s access to music by running all of his client’s music through Hill and Range publishing. Other “experts” accuse the Colonel of preying on Elvis’s vulnerability for his own benefit, running Elvis’s movie career onto the rocks, and preventing Elvis from touring overseas. A couple of times, the Colonel is allowed to defend himself in his own words. Once he claims that, although he negotiated Elvis’s movie contracts, Elvis still could have refused to do the films the studios offered. It’s Tom Petty who asks the critical question about the relationship between Elvis Presley and Tom Parker. “Elvis: The Searcher” has very little to say about Elvis’s movies. For the most part, the “experts” characterize Presley’s Hollywood career as like a car careening down a dead end road in the middle of a vast creative wasteland. Priscilla provides the only positive comment by saying that the studios at least treated Elvis with respect in the early days. Again, it was Tom Petty who provides the most pertinent commentary on Elvis’s film career. 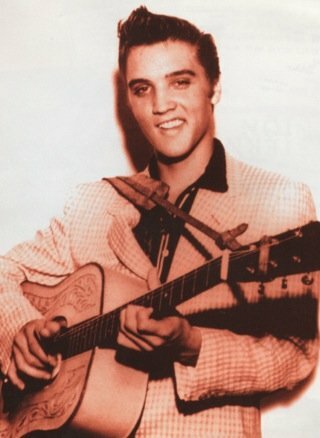 As for his music in the sixties, Priscilla points out a creative weakness that held Elvis back. “Elvis didn’t write own songs, so he couldn’t control his career like others in the ’60s.” What Elvis needed, she says, was someone to come in with a plan of what to do next. 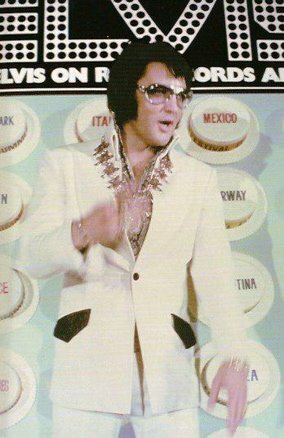 Eventually that man was Steve Binder and his plan for Elvis was the 1968 TV special. In “Elvis: The Searcher,” the “experts” are united in portraying that show as the being a pivotal event in Presley’s career. The film quickly moves on, taking note of the Memphis recording sessions in 1969, the triumphant Las Vegas debut the same year, and the return to touring in 1970. With less than 30 minutes left to go, the documentary closes in on Presley’s 1973 “Aloha From Hawaii” concert, a segment I’d been anxiously awaiting. Certainly the producers, who’s goal was to create the “definitive story of the man behind the music,” would not give credence to the phony legend that for decades has surrounded Elvis’s “Aloha” show. Surely this documentary, supported by so many “experts,” will finally set the record straight. But it failed to do so. It started with Jerry Schilling explaining that instead of letting Elvis tour overseas, the Colonel decided to “come up with “something nobody had ever done.” I knew what was coming next. 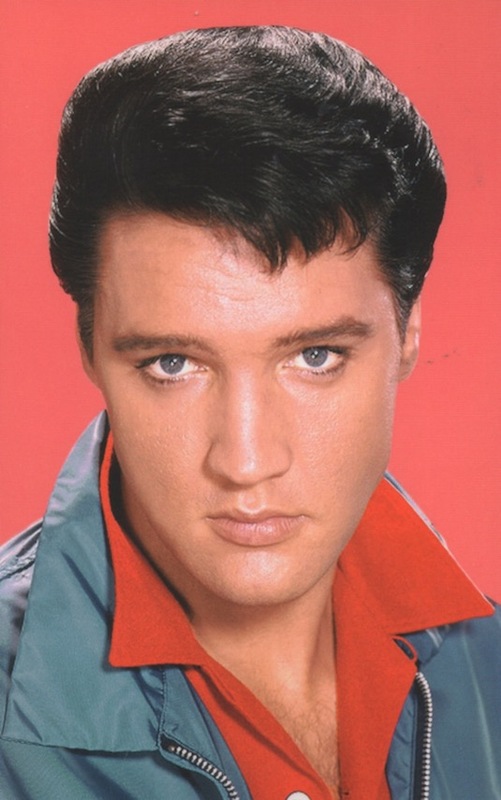 Sony producer John Jackson then repeated the preposterous Elvis myth that just won’t die. 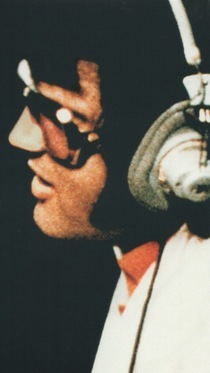 “Elvis: The Searcher” concludes with Presley’s final recording sessions at Graceland in 1976. It’s an obvious place to pull the plug, since the film’s focus is primarily on “Elvis the musical artist.” All the messy business leading up to and following his death the next year are ignored, thank goodness. Only one more question remains needs to be asked of the producers of “Elvis: The Searcher.” Who came up with that goofy photo that was used in all of publicity leading up to the film’s broadcast? 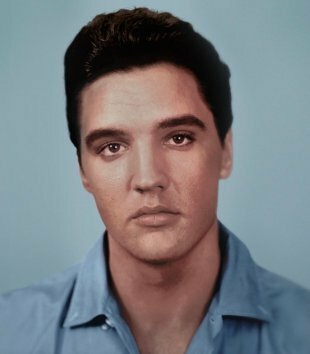 I mean, you’re trying to portray Elvis as a great musical artist, and you showcase this featureless mug shot as the film’s visual hook? 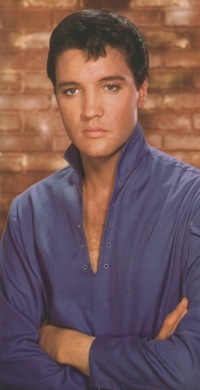 Worse yet, the photo shows a brown-eyed Elvis when everyone knows he had blue eyes. That has already given life to a web conspiracy theory claiming that this is really a picture of Jesse Garon Presley, Elvis’s twin brother, who this picture proves didn’t really die at birth! Thus the documentary perpetuates one myth and may give rise to another. “Elvis: The Searcher” is certainly a very entertaining film. 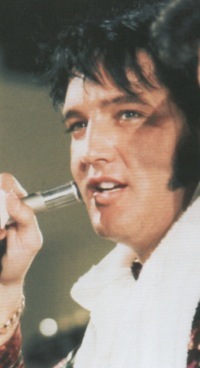 The director’s decision to use unseen “experts” to provide the narration keeps the focus on Elvis’s journey from start to finish. The shotgun photos and video snippets, combined with a judicious use of slow motion, zoom-in shots, and other special effects, keep the viewer’s eyes glued to the screen. It was inevitable, though, that the producers would come up short of their goal of creating the “definitive story of the man behind the music.” Priscilla says they originally were considering a six-hour film but decided to cut that in half. That resulted in parts of Elvis’s career being left out or given insufficient coverage. For example, the year 1957, which featured three of Elvis’s biggest hit records and two of his most significant films, is completely jumped over. 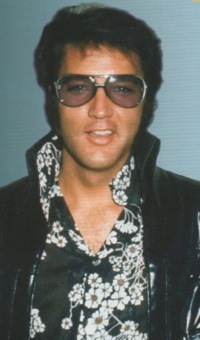 Elvis’s entire Hollywood career is dismissed as unworthy of being taken seriously. Also, not exposing the “Aloha” satellite myth was a lost opportunity. In the final analysis, though, “Elvis: The Searcher” is clearly the best documentary film that now exists about the life and career of Elvis Presley. Its visual design is impressive, and its cast of “experts” provide informative and pertinent commentary throughout. 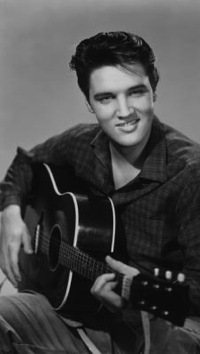 The film’s wide scope brings into focus the historical and cultural landscape of the fifties, which allowed an entertainer like Elvis Presley to grow and flourish. To really appreciate all its nuances, “Elvis: The Searcher” should be viewed more than once. HBO continues to show “Elvis: The Searcher” several times a week on its family of channels. HBO subscribers can view the film “On Demand” at any time. For now, non-subscribing Elvis fans will have to find HBO friend willing to give them access to the film. 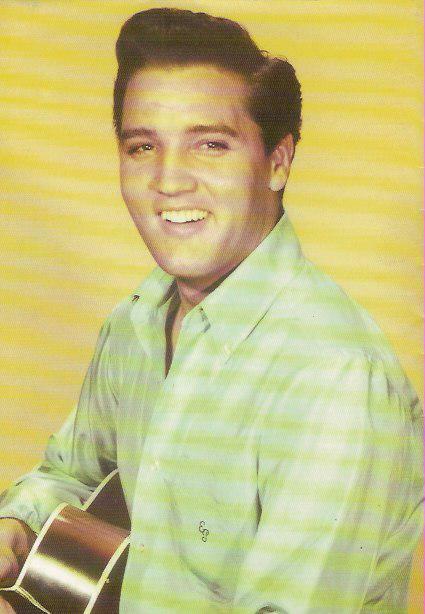 Eventually, “Elvis: The Searcher” will be available for purchase on DVD. For those who haven’t yet seen it, the wait, whether it’s days or months, will be well worth it. In closing, I’m including a couple of my favorite quotations from “Elvis: The Searcher.” They combine to create a brief declaration of Elvis Presley’s contribution to American music and culture.